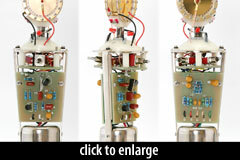 The V67i is a unique FET condenser mic, in that its dual-diaphragm capsule is tuned for two different voicings, “warm” and “bright.” The front diaphragm uses 6-micron Mylar, and the rear uses 8-micron Mylar. A switch beneath the gold headbasket allows selection of the front or rear. 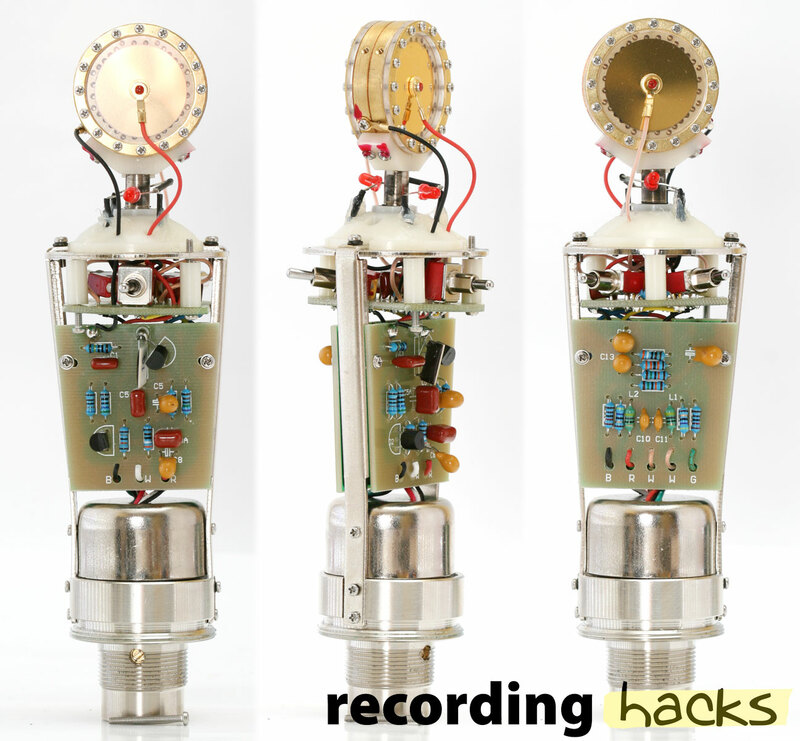 Beneath the capsule, the microphone circuitry is the same as in the V67G (also a cardioid FET condenser): it is a 2-stage FET circuit, with the first stage more or less a copy of the Neumann U87, and the second stage an emitter follower, with a low-ratio output transformer. What we saw in our sample mic (purchased via retail channels) is that the “warm” side peaks at +5.5dB @ 12kHz, while the “bright” side peaks at +6dB @ 10kHz. The latter might be perceived as brighter because it rolls off the highs sharply above 12kHz, whereas the “warm” side has a more gradual rolloff. A red LED behind the grille indicates which capsule is in use. Frequency Response - Cardioid (“Warm”)Click Graph to Compare! 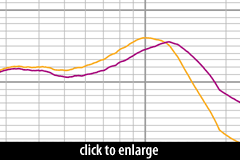 Frequency Response - Cardioid (“Bright”)Click Graph to Compare!